What exactly is an 808? "The moon, the stars, everything plays a part. And there are no accidents. Music is made out of necessity. It's a fact of life. Just like breathing. The voice inside tells U when there is a song 2 be born. All children are born beautiful, How that are perceived may be another matter indeed. Much like an unborn child, a song is never conceived whole. That would be like taking dictation. Pleasure comes from not knowing what your baby's character will be. Pleasure comes from the nurturing process. Whatever we are... Whatever we make." Those are the words of enigmatic rock midget Prince - a rare direct quote from the back pages of his Diamonds And Pearls tour programme in 1992 - making it clear that writing music is a compulsion, an obsession. Something over which he has almost no control. So what must it be like when that muse deserts you? Prince's work rate has flatlined over the last decade. 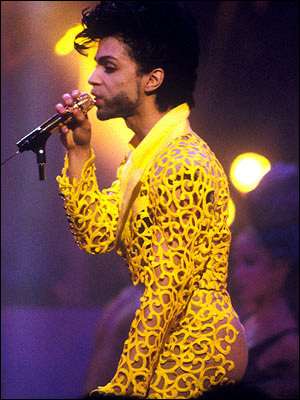 The man who wrote Little Red Corvette while drifting to sleep in his bandmate's bright pink Ford Edsel, and who used to churn out four albums a year via a multitude of side projects, has only managed five studio records since 2000. Maybe it's a relief, breaking the bond to this restless muse and reclaiming your sleep. But I'd wager there's a feeling of bereavement. If Prince sees his songs as children, he's experiencing the musical equivalent of empty nest syndrome. Not that the purple pixie stopped writing completely. He turned up on Jimmy Kimmel's TV show on Tuesday to play his new single, Rock n Roll Love Affair. It's a fairly uninspired romp through the blues, with a chilly blast of Minneapolis horns - the sort of thing he used to knock off in an afternoon. But watching him perform is always mesmerising, and the magic moment here is a cheeky little guitar solo around 2'20". 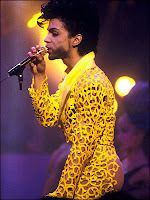 In the meantime, I'm off to dig out the Lovesexy DVD for an afternoon of Paisley Park-themed nostalgia.